Sandals "Barefoot in the Grass"
Astroturf; clear vinyl; rubber sole. Surreal and pop sandals. 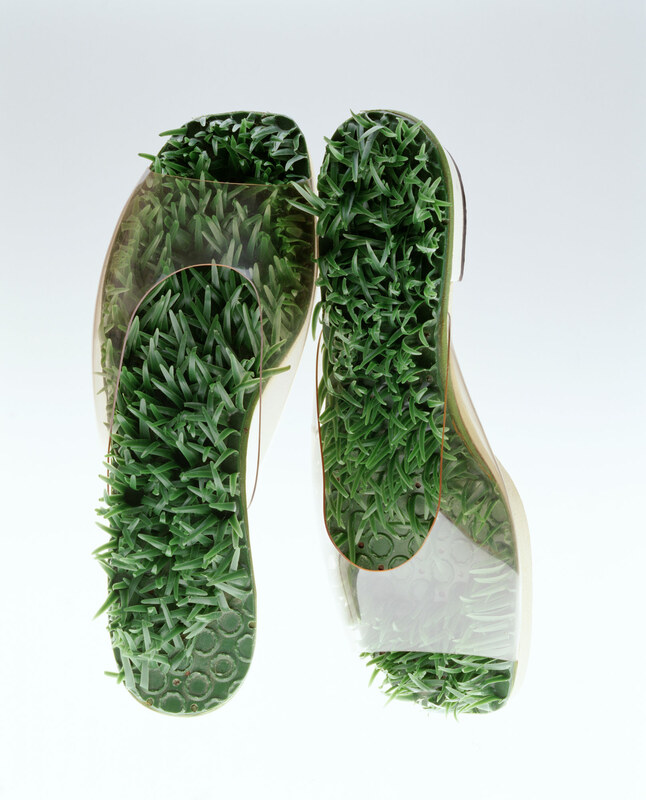 Through the upper made of transparent vinyl you can see the sole covered with artificial grass, and you can imagine at a glance how your feet would feel in this footwear. The synthetic materials which were popular in the 1960s stimulated human bodies optically and haptically with their artificial new textures. Beth and Herbert Levine established Herbert Levine in the U.S.A. in 1958. Their innovative designs brought a fresh sensitivity to shoe design by boldly using synthetic materials such as loafers made of transparent vinyl and boots of stretch materials.